I escaped into a surreal wonderland of psychedelic frogs and dream time while on a mekoro safari in the tranquil heart of the Okavango Delta. 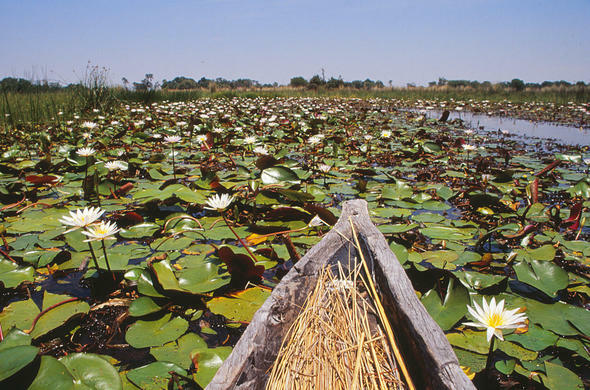 The Okavango Delta, a miracle in the desert, an oasis, in short paradise. This wet wonderland stretches for miles in the heart of the Kalahari. We were staying in the heart of it all at Xugana Island Lodge. One of the best features of the lodge was the spacious deck area overlooking a huge mirror-like lagoon. While staying at Xugana, I experienced my first Mokoro safari. A mokoro is a traditional boat, usually carved out of a huge tree. Mekoro is the word used when there is more than one mokoro. These boats were the traditional mode in transport in the Delta for thousands of years. Today however, you are likely to travel in a fibreglass mokoro, as these are considered more eco-friendly and save the large trees of the Delta from being felled. I climbed into my mokoro which I shared with my friend Leigh and our Poler. With the water just inches from the top of the canoe, I struggled to stay still and find my sea legs. I did not want to upset the canoe, although the water was less than a meter deep. All around it was quiet and all I could hear were the swirls and eddies of the water as our guide poled us through the water. The lagoon water mirrored the changing colours of the sky as the sun began to set and the water had a bronze sheen. We brushed past phragmites reeds which were home to ghost white frogs. The beautiful frogs were bejewelled with red spots, shining like rubies - little living faberge creations. We could drift right up close to these fascinating frogs. Soon we spotted different species. One was sitting in the centre of a pale white water-lily; it was a red and white stripped frog, who watched us with beady black eyes as we drifted up.Overhead a flock of Egrets passed like ghosts in the twilight. Nearby a tiny little Malachite Kingfisher was perched on a reed, staring intently into the depths of the water. Suddenly it darted like a strike of lightning into the water, reappearing seconds later with a small fish speared on his orange beak. He flew off behind a clump of fringed reeds to enjoy his dinner in peace. The reeds were casting shadows, and the pathways of the Delta took on a bewitching sultry air. We turned and headed back to the launching station, slipping through the water with greater purpose. Once we has landed we wandered a few metres onto a grassy field that served as the runway where the planes come in to land, there we enjoyed sundowners as the setting sun continued to flood the sky with colour. Sipping a refreshing drip, one cannot help but be inspired by the splendour of the Delta. It was like falling under some bewitching spell, or discovering the Aboriginal land of Dream Time. This was a truly magical experience that made me realise that at that moment all else was forgotten. I realised that I was meant to be right there, in that exact spot, in that moment of perfect peace and tranquillity.